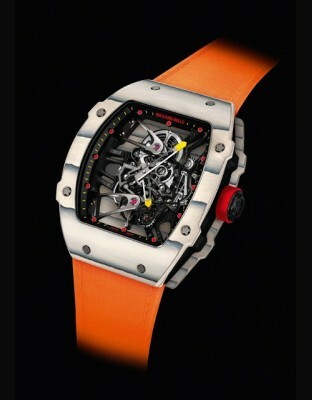 Price request for RM 27-02 Tourbillon Rafael NadalRef. 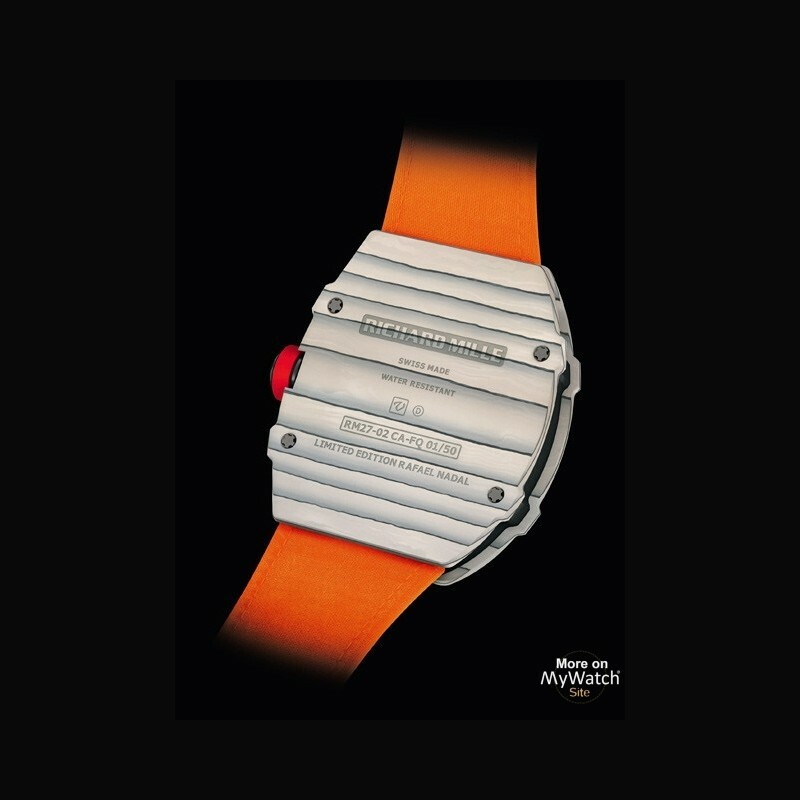 Watchmaking must be consistently challenged, both technically and artistically. 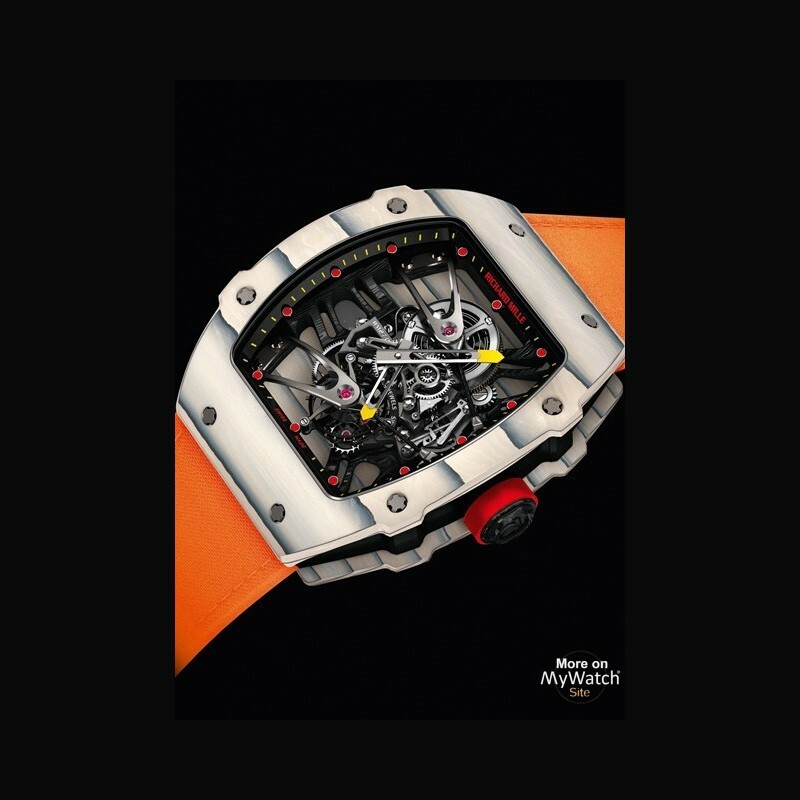 With the RM 27-02, Richard Mille presents a new uncompromising caliber that reinterprets the art and methods of watch design in the 21st century. 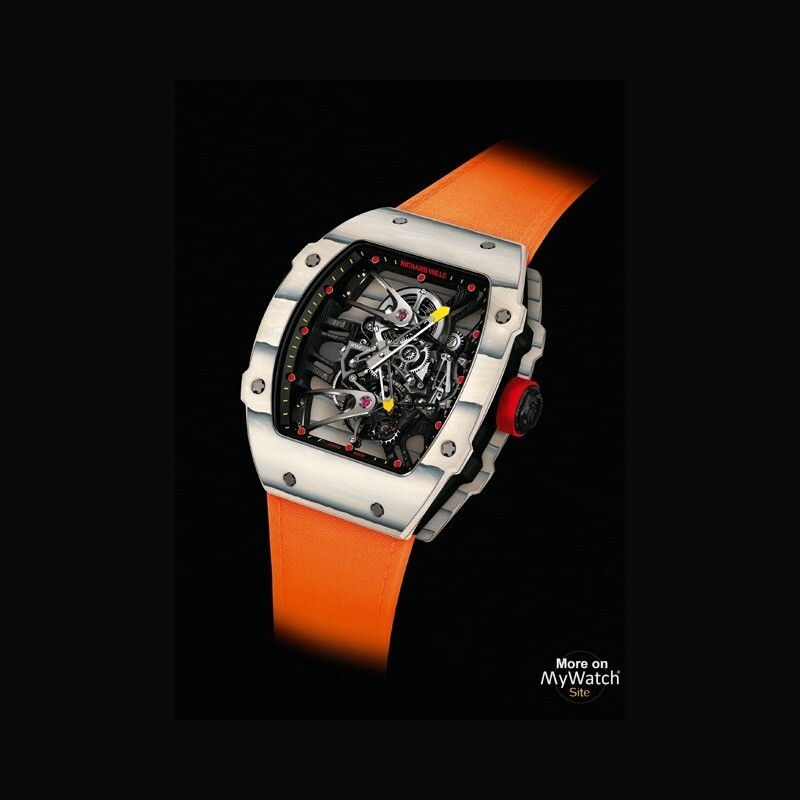 It is in the run-up to the 114th French Open, where emblematic Richard Mille partner Rafael Nadal will be vying for his tenth title, that the Swiss Jura brand is unveiling its new manual winding tourbillon caliber dedicated to tennis. 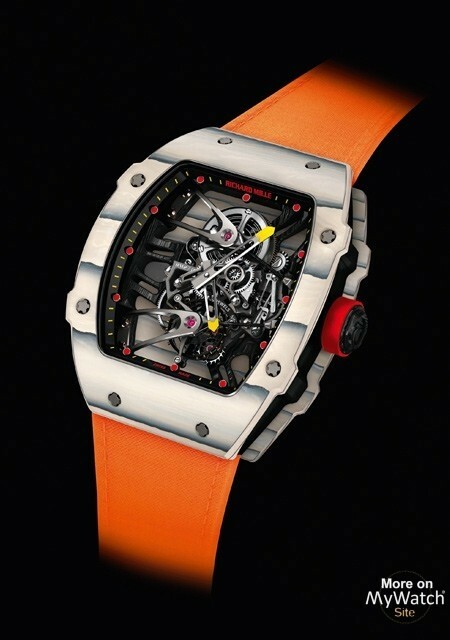 Following research by Richard Mille’s engineers into NTPT® carbon—a material with remarkable mechanical properties and excellent resistance to micro-cracks—the brand is unveiling the very ﬁrst skeletonised baseplate known as “unibody”, in which the caseband and baseplate have been fused into a single piece, removing the need to attach the two components together. This structure, inspired by the chassis of racing cars, enhances rigidity and resistance to impacts when used in watchmaking. 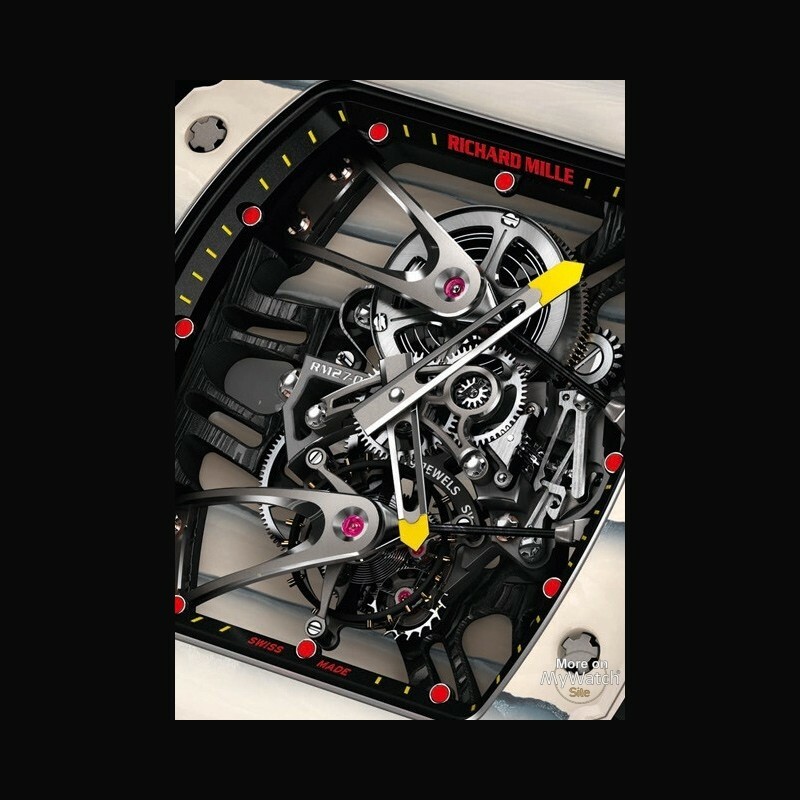 A major watchmaking and technological breakthrough machined at ProArt, the unibody baseplate is a technical feat that requires in-depth knowledge and mastery of micro-machining new materials—a concept that Richard Mille has nurtured since the very beginning. The sculptural baseplate supports the bridges in grade 5 titanium, which are highly original in terms of their three-dimensional construction, their ﬁnishes (beveled, shot-blasted and satin-brushed by hand) and the complexity of their titanium and carbon composition. These bridges support an impressive mechanical heart capable of running for over 70 hours without detriment to its regularity thanks to a rapidly rotating barrel that delivers constant power from the beginning to the end of operation. Such innovations are not limited to the heart of the watch, as demonstrated by the categorical absence of compromise on the case. Dressed in black and white, it inevitably catches the eye with its unique appearance. Working with North Thin Ply Technology, Richard Mille’s engineers have developed a highly original material known as TPT® quartz, composed of hundreds of layers of quartz ﬁlaments piled on top of each other. These ﬁbers are exceptionally resistant to high temperatures and are characterized by extreme strength and transparency to electromagnetic waves. No thicker than 45 microns, the silica layers are inserted between layers of NTPT® carbon by an automatic positioning system that changes the orientation of the ﬁbers between each layer by 45°. Heated to 120°C in an autoclave similar to those used to make aeronautical components, the material is then ready for machining at ProArt. During this phase, the various layers of TPT® quartz and NTPT® carbon are revealed at random, ensuring that each machined component is as unique as the heart of the baseplate, which is machined using the same process. The bezel and solid case back in NTPT® carbon/TPT® quartz are then attached to the unibody baseplate using 12 spline screws in grade 5 titanium. A sapphire crystal with anti-glare treatment adds the ﬁnal ﬁnishing touch to this unique combination. Like the RM 006, RM 008 and RM 012 tourbillons, the RM 27-02 belongs to the elite circle of Richard Mille watches destined to leave their mark on their era. With a production run of just 50 models, the RM 27-02 is a rare product reserved for those closest to the brand. As usual, Rafael Nadal will carry out the ultimate approval test by wearing this new caliber in his international matches.